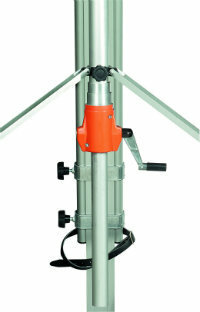 GSR Heavy Duty Aluminium Elevating Tripod 2.10m to 4.3m. Suitable for heavy rotating lasers. Crank handle at the low end for convenience. Heavy duty crank mechanism for easy handling. Slip-Guard to prevent the legs from spreading unintentionally.